A week or three ago I posted this picture as a part of my lazy Month of Gardner. 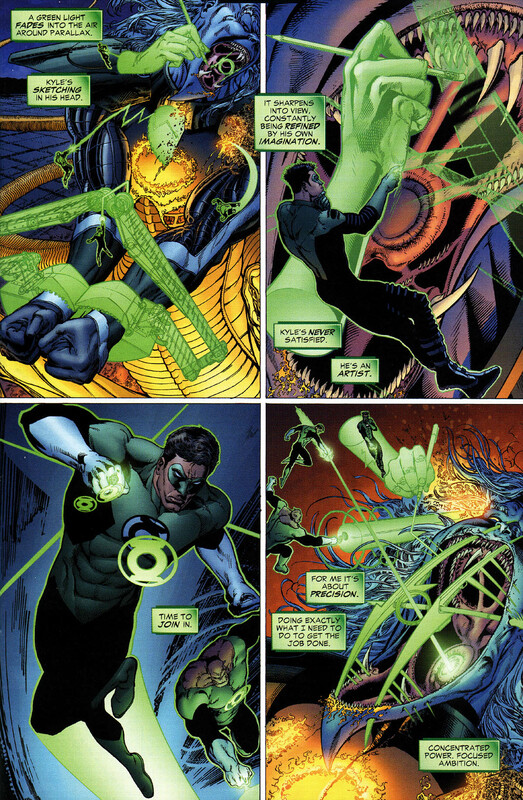 It is from a pair of pages in Green Lantern Rebirth #6, written by Geoff Johns and drawn by Ethan Van Sciver, which shows the differences in how each of these Green Lanterns use their rings. Although I think these distinctions largely started there and have been used at best sporadically since then, I do really like the idea of each Lantern having a different style. The rest of Rebirth can be problematic. For the record, I am pro-Rebirth. I like what it did and I mostly like how it did it, but there is no getting around the fact that it is a six issue long retcon or that Johns writes Hal Jordan as though he were Batman. I understand how that could grate on those who did not want to see Hal redeemed. However, I thought Emerald Twilight, the story where Hal goes bad, was somewhat terrible and I would rather have a functioning Green Lantern Corps than Kyle Raynor as Luke Skywalker. Geoff Johns also did a good job of not diminishing Kyle in bringing back Hal. Yes, Hal, not Kyle is the Green Lantern, but even in Rebirth Kyle, John, Kilowog, and Guy get their chances to shine. However, the reader feels about the “fix” that is Green Lantern: Rebirth, these two pages are really good. Johns is the master at shaping years of often contradictory or confusing stories, revitalizing tired characters and giving them relatable hooks for future stories. 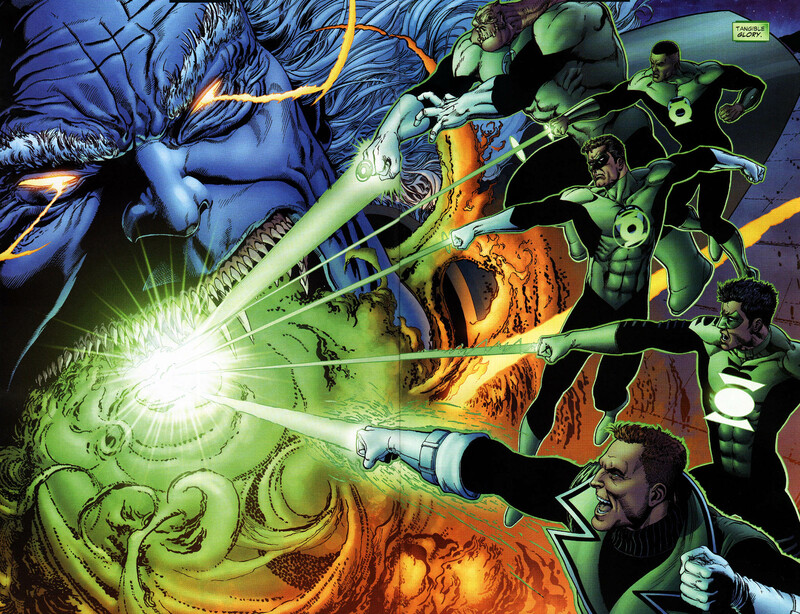 In just a few pages, he manages to get to the heart of all five of the main Green Lanterns. First John Stewart. His constructs are actually constructed. He builds them, uses his knowledge as an architect to use his green powers more effectively. He is thoughtful and careful in how he uses his ring. Next is Guy Gardner. Rather than John’s careful approach, Guy is reckless. He is all heart and no control. Then there is Kilowog. The only non-human in this group, his ring sends out constructs that are bigger than the others are. That his ring booms shows its raw power. Kyle Raynor is an artist, and he uses flourishes and constant refinement. He is never satisfied and he never gives up. Last is Hal Jordan, who uses precision and focused power. It really shows what every one of them is about. John and Kyle are thoughtful and somewhat introspective. Their actions are carefully considered and they are rarely rash. Guy is the opposite. He is just held back from action at all time, with almost no thought past his initial instincts. Hal is somewhere in between. He tends toward reckless and instinctive, but is more careful than Guy and choosing his targets. Kilowog’s explanation is probably the least illuminating. 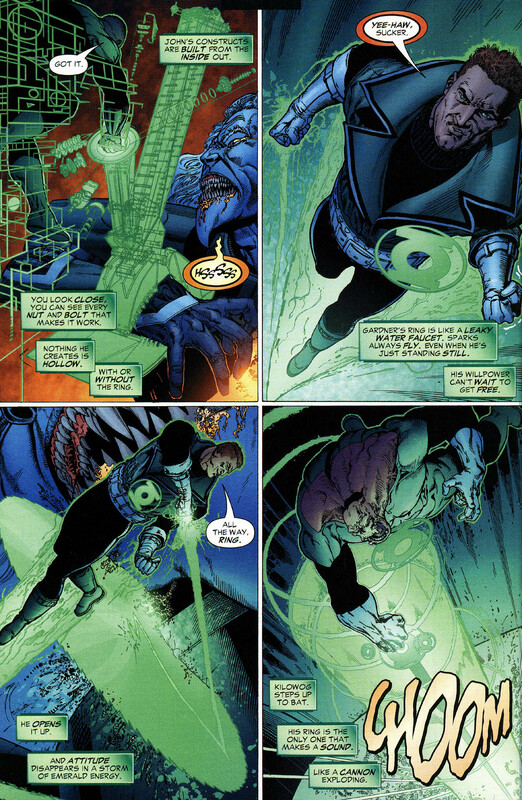 His booming ring shows that he cannot be ignored, but it really tells the reader little about who Kilowog is. Still, Johns goes at least 4/5 on explaining who these Green Lanterns are. I just really like how someone who has little knowledge of these characters before reading this, like me not that long ago, would have a decent grasp of all of them from just these few pages.